Get your kids eating healthy food. It's important that kids get good nutrition so they can grow and thrive. Read on for tips on getting kids to eat healthy food, where to find child-friendly information on fruits and vegetables and healthy food recipes for kids. When children eat more fruit and vegetables they generally experience better health and increased energy. When parents eat more raw fruit and vegetables, their children do too. This nutritional increase noticeably enhances their health not just for now and but in the future too. Introduce your children to a food cycle that is whole lot more engaging and exciting than a trip to the supermarket. When you take a step further and get your children involved in growing healthy organic food, you’ll be surprised how keen they are to pick and eat what they grow. A lot of it won’t even make it from the kids vegetable garden to the kitchen! Talk to them about the food you’re growing and eating so they become both knowledgeable and environmentally responsible. Getting kids to eat healthy food is a challenge you can make fun. The key is to help them enjoy what they’re eating. With fruits and vegetables coming in a huge variety of colours, shapes, smells and flavours, it can be easy to get even fussy eaters interested. Read on for some tips on how to get your kids eating healthy - early! 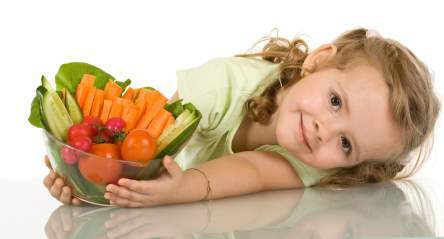 Healthy Diets for Kids - What's all the fuss about health diets for children? Studies show that healthy diets for kids are vitally important. Here's how you can influence your children’s health and eating habits later in life. The best vegetable gardens for kids provide healthy snacks while kids are on the go, as well as opportunities to learn. The kids vegetable garden is all theirs to experiment with and develop gardening skills that will be useful for life. A healthy diet for kids must include several serves of vegetables daily. Here are 20 ways for parents to get creative and include more vegetables to boost the day’s veggie count. Take a look at these healthy snack recipes for kids. Getting your kids to like healthy food is easier than you think if you can maintain an open mind, a little patience, and a lot of creativity! These garden activities for kids will entice your children happily into the outdoors. Garden crafts for kids can enhance the experience of vegetable gardening by enabling children to decorate and own a space in their garden. These 3 essential healthy habits for kids support the development of skills that will benefit your kids for a lifetime. You can provide nutritious and enticing finger foods for kids parties. These kids birthday party food recipes are popular, nutritious and easy to prepare. Get your kids eating healthy even at party time. Fresh for Kids provides a child-friendly list of fruit and vegetables . Click on each fruit or vegetable for an informative fact sheet which includes growing and harvesting facts, choosing and keeping fresh tips and some healthy food recipes for kids to try. Need a quick fix that will boost your kids' nutrition and have your kids eating healthy and happy at the same time? Give green smoothies a try. Children love the flavour and they're packed with nutritious greens. Become a friend of Growing Raw. 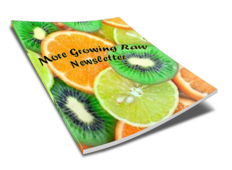 Sign up for the "More Growing Raw" newsletter to receive regular updates, earlybird discounts and deals and news about Growing Raw competitions and results. You'll also receive your free copy of "The 5 Secrets to Healthy Snacking." Snack time is when many aspiring healthy eaters come undone, so learn the top 5 secrets for staying on track with your healthy diet when the munchies hit.